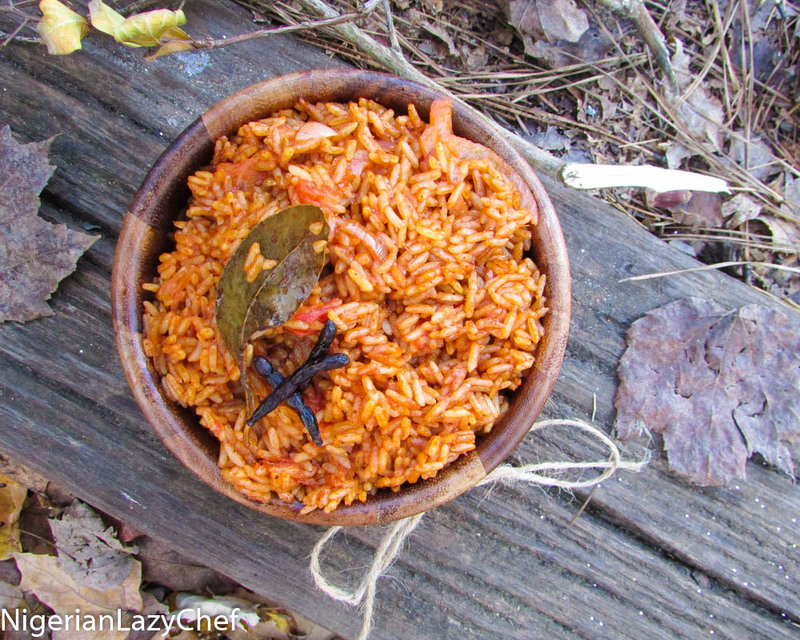 Anyway, I was on Youtube with my ajebutter watching videos on how to make slime(don’t ask why we were making slime, but it is one of our favorite things to do 🙂 ) I bumped into Ndudu by fafa’s video on how to make smoked jollof rice and I was so mesmerized and I decided to make some, but with my own technics. Of all the Nigerian foods that are bae, Jollof is “baest” And making perfectly it is all in the technic and ingredients. 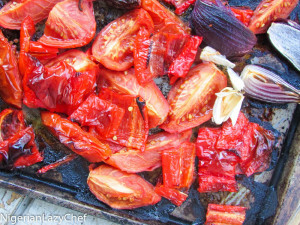 One thing that makes this recipe uber smoked for me is the roasting of the peppers, onion, garlic and tomatoes. Kaii! 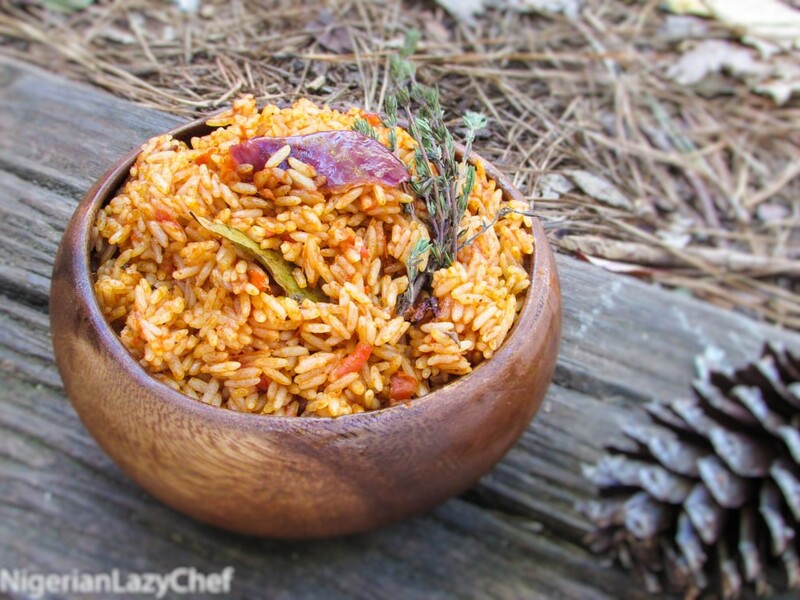 It added that smokey flavor and you can tell the slight difference between this and the regular jollof rice. As in I now roast, blend and save my tomatoes, pepper and onions for my Nigerian stew and sauce recipes. Heat up one tbsp. of butter along with the oil and slice in the remaining half of the onion. 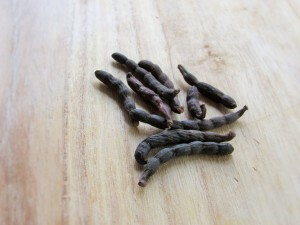 Sauté until almost translucent; then add the thyme, bay leaf, curry, white pepper, uda sprigs and black pepper. 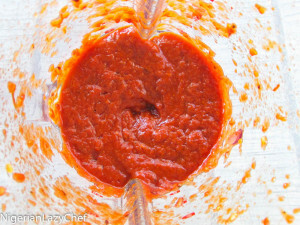 Stir for a few minutes to release the flavors in the herbs; then pour in the tomato mix along with the tomato paste. Stir fry until the oil has floated to the top and the mix has darkened(but not burnt). At this point the oil content may seem too much, so you will have to decant some which you can use to make some Nigerian stew later. Pour in the rice and stir it into the sauce making sure to coat each grain with the sauce. Pour in the meat stock to a little above the rice and check for seasonings. Add the bouillon and salt if needed and as needed; do not stir. Bring to a slight boil; then cover with a steam bag or foil sheet; then tightly place the lid of the pot over it and let it cook on medium heat. Once the liquid has dried out, check the rice for doneness. Stir in the nut meg, the half tbsp.of butter,onion, tomato and ginger. 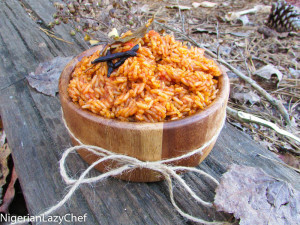 This entry was posted in Christmas recipes, jollof, Jollof rice, Rice, Rice Dishes, Rice Recipes, Smoked jollof rice, Uncategorized and tagged Christmas rice, jollof recipe, Jollof rice recipe, Nigerian food blog, Nigerian Lazy chef, Nigerian party jollof recipe, Nigerian recipes, Owambe, party jollof rice recipe, roasted tomatoes and peppers, smoked jollof rice recipe, tatase. I certainly will try this today, then cook it again on christmas day. pls nma what is uda sprigs? do u know if one can get it abroad? Thx for this. Pls how many uda springs should be used also is it possible to attach a link of the uda picture so I don’t use the wrong thing.